After a few viewings I wondered if there was something more to the picture of Mt.Rushmore that Albert gives Gordon. Is there a special image in the clouds? Or is my brain just trying to put something there? I think it was just another joke for the scene, Albert knows Gordon, that he'll mention he can't see Mt. 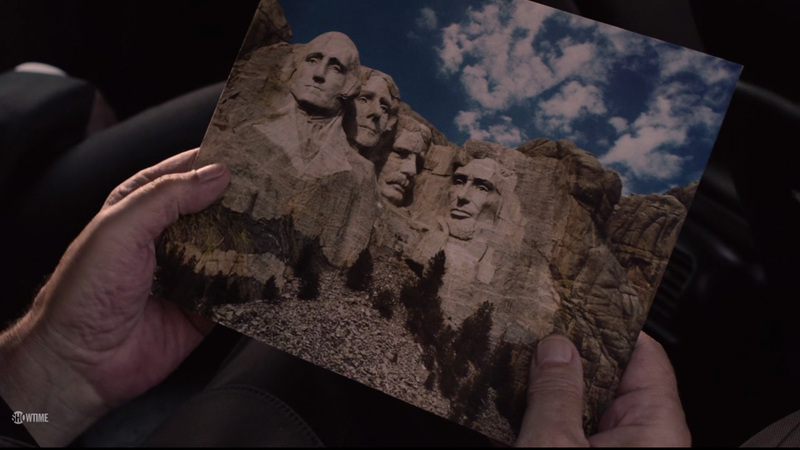 Rushmore, so he brings along the picture to make him happy. "Richard and Linda. Two birds, one stone." There they are, folks. Faces etched in stone. Half kidding, but I'm hoping that's not the stone in question. There's definitely a lot of presidential references here. The Lincoln head on the penny. Sheriff Truman. The picture of Eisenhower in the Horne home. I'm sure there are more as well. Circled in red is the face in the cloud. Next to it for easy comparison is The Woodsman from early in episode two when he appeared in the jail cell next to Hastings'. --So-- As I said. For your consideration. - - NOTE - I can't attach photos! I've tried twice, page comes up white, nothing's posted. I'm trying to insert the photo via HTML linking to where I have the photo online. Other characters with a sort of cold/stone-like/empty faces are Mr. C 24/7 and Red at the bang bang bar at the end of episode 2 after he points the gun at Shelly and gets her to smile. Both of these characters seem to follow the woodsmens sort of logic, gotta light(trouble and enjoyment), and white on surface black within(Red seemed alright to Shelly, then quickly switched to the 'face of stone' expression one he realized he made her smile). Aaron C. Wade - I hope you saw my reply to this thread of yours. Maybe you're not subscribed. Come back and look if you haven't. I produced an image which shows you actually may have something there about a face in the clouds. Hmmmmm. ---well, I think I may have something there with the face in the cloud and The Woodsman's first appearance. Anyone else? Was hoping to hear from Aaron C. Wade, the OP again. Yes - it definitely looks like a face - the cloud shapes making up the eyes don't seem to make any 'sense' as clouds, IYSWIM? At the time I was too busy realising that - along with most folk in the world - I'd always been aware of Mount Rushmore, but I had absolutely no idea it was in South Dakota! Like unique patterns in wood, rocks, etc. in clouds you can see what your imagination decides to see. "Like unique patterns in wood, rocks, etc. in clouds you can see what your imagination decides to see." That's right, Karen - That's what Aaron was suggesting in his original post. I made the composite image to show that in this particular cloud image, we can all see it's very much like The Woodsman's first scene. It doesn't seem to be a perceived pattern unique to either Aaron or myself. You don't think so? The expression is the same, mouth in the same position, eyes wide, brows arched the same way - I mean, you're seeing that too aren't you? But if you are, is it only because I've shown you what I saw?-- hmmmm, I'm not so sure about that. Some of the woodsmen (if not all) in part 8 resembled historical figures. The "Gotta Light"-woodsman resembled Abe Lincoln (the actor is apparently even a Lincoln-impersonator), so there is your link with Mount Rushmore. That's right - Robert Broski, playing The Woodsman, had to have been chosen by Lynch because of the actor's association with Lincoln. A lot of viewers did make the instant connection - Broski is best known for a short film from 2014 with the clever title of "Abraham Linclone." Maurice, I wonder what you think of the screenshot composite I posted on this thread. 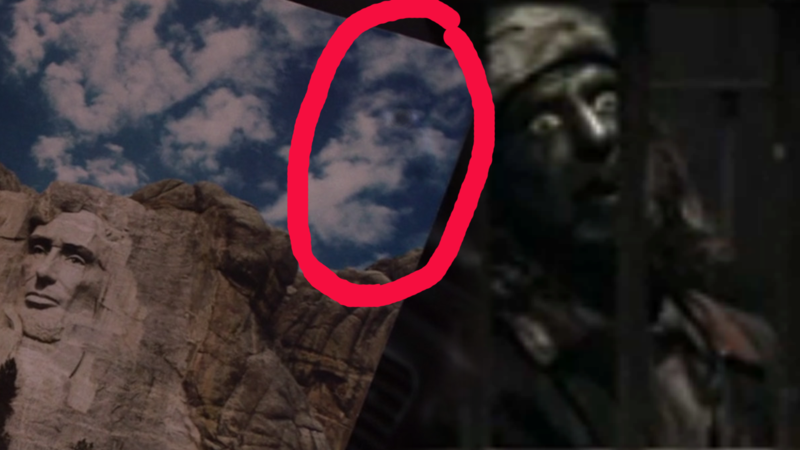 Do you find it plausible that The Woodsman's face was purposely suggested in that cloud formation? There haven't been any comments - I've been curious what people think.